Senior Airman Rodriguez is jarred awake by the buzzing of her alarm clock at 0500 hours. She slaps the button to turn it off. It’s already time to start another work day as an NDI (non-destructive inspection) Technician in the United States Air Force. She can already hear activity outside her barracks. Located in Italy, Aviano Air Base wakes up bright and early every day. Senior Airman Rodriguez is no exception. Half an hour later her boots hit the pavement as she makes her way through the base to the NDI shop. The sun is barely peeking out from behind the jagged mountain tops. Senior Airman Rodriguez is new to Italy, today marking her first month on base. She still has a sense of amazement about the mountains, which starkly contrast the flat landscape of her home state of Florida. She finally arrives at the shop and is greeted by Sergeant Wagner. Sergeant Wagner is always in good spirits, no matter how busy the shop gets. As Senior Airman Rodriguez settles down she notices the energy of the shop is amped up. Yesterday was a slower day. There were not many inspections scheduled, and all were of small components. Today, there is a report filed to inspect a turbine engine of a combat aircraft. This means that both Senior Airman Rodriguez and Sergeant Wagner have to make the trip to the base’s aircraft hanger to get an up close look at the problem turbine. Before leaving the shop, Senior Airman Rodriguez packs up the essential tools and relevant paperwork for the task at hand. One tool she knows she absolutely needs for this type of inspection is a handheld borescope unit. 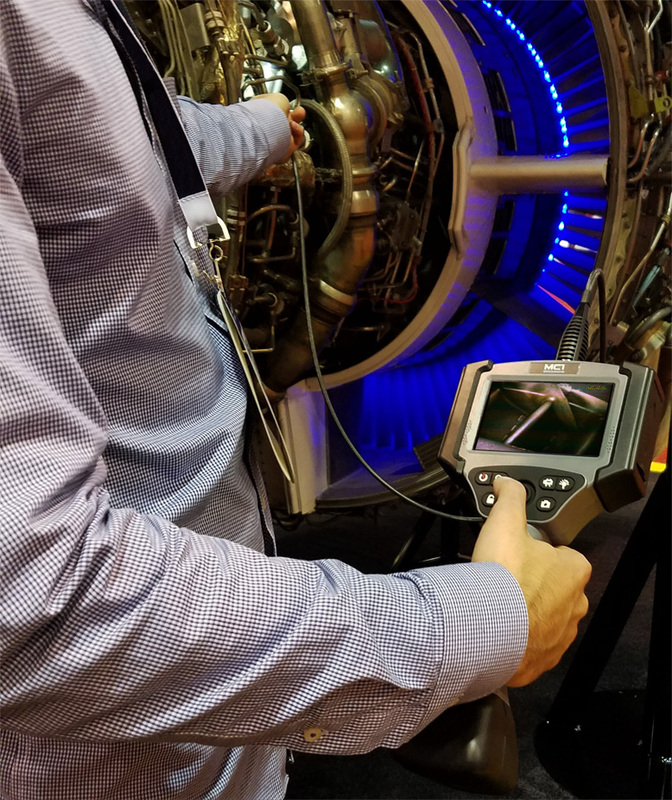 A borescope is perfect for conducting preliminary visual tests to see if there are any signs of damage deep inside a turbine engine. The components that are sent to an Air Force non-destructive inspection shop are made of different materials, exposed to different conditions, and are part of many different aircraft. 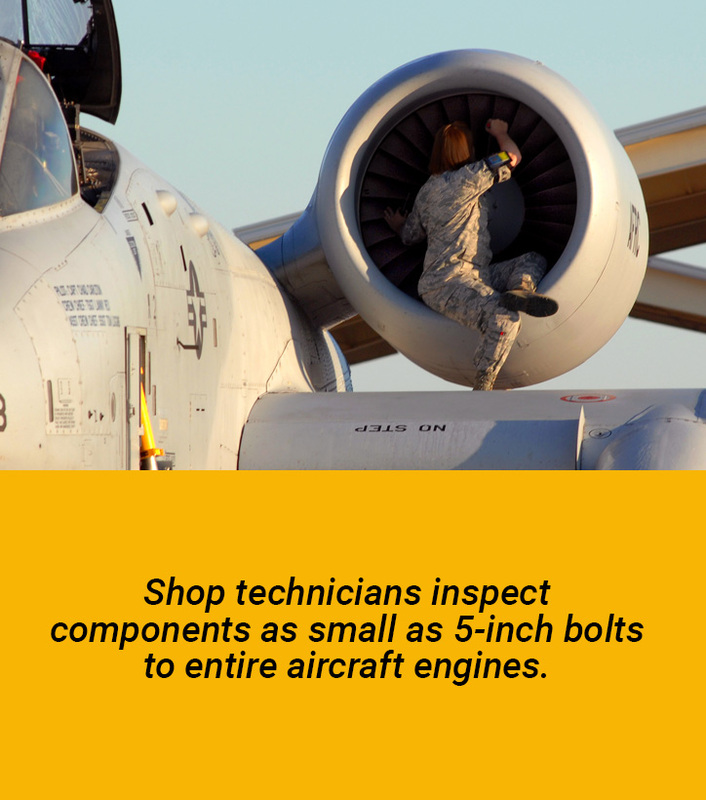 Shop technicians inspect components as small as 5-inch bolts to entire aircraft engines. About 3 months of technical training along with all of these testing techniques ensure that the Air Force technicians are well equipped to inspect any aircraft component that comes into the shop. The problem is, aircraft engines are complex and extremely hard to see inside them. 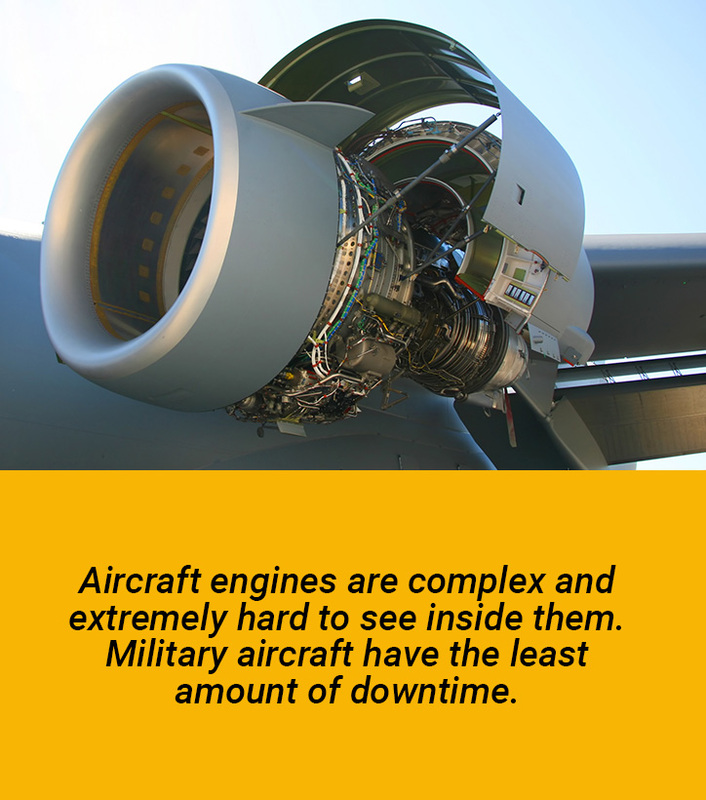 Military aircraft have to have the least amount of downtime since they need to be available at a moment’s notice. In these cases, visual inspections are essential. Visual inspections help technicians first detect any corrosion, cracking, and other signs of wear in the component. The other testing methods are employed to paint a clearer picture of the damage. The military is an industry in and of itself that takes pride in its excellent engineering and safety protocols. Ongoing maintenance and repair is a daily part of their technician’s work day. This helps to guarantee the safety of their fellow workers as well as the safety of their nation as a whole. Being able to count on reliable and accurate visual inspections is a cornerstone in safety. 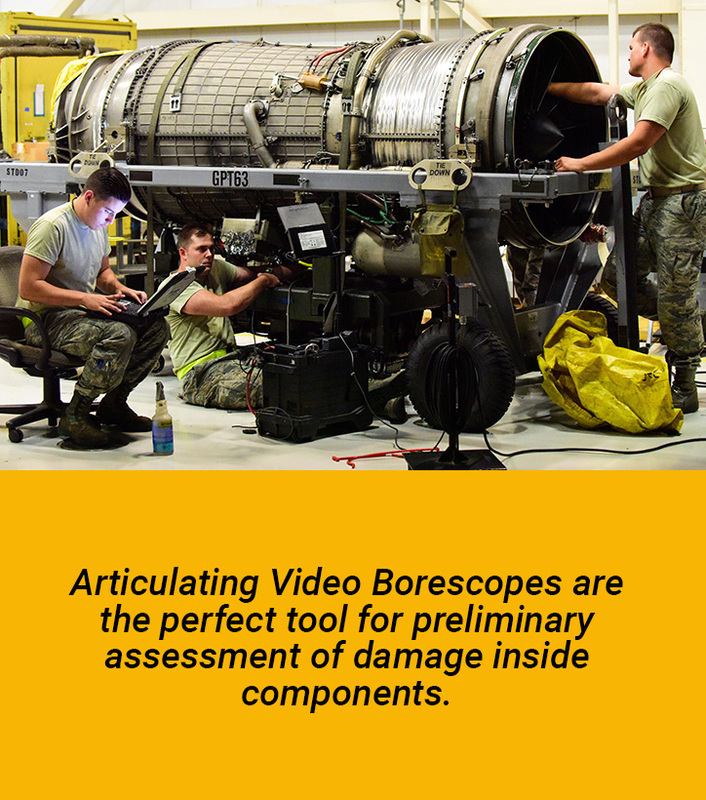 Articulating Video Borescopes are the perfect tool for a preliminary assessment of damage inside components. Borescopes help to quickly locate any points of wear and tear inside very small, dark places. Turbine engines, valves, combustion chambers, and more can easily be visualized using these tools. Our two most Popular Articulating Video Borescopes for the Military Market include: The MC1 SERIES & The X1 SERIES. 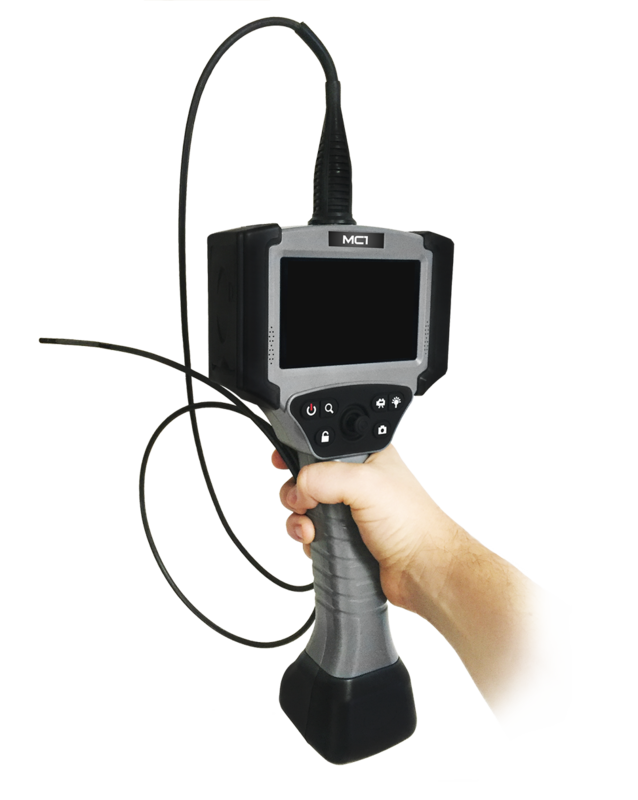 The MC1 Series Mechanical Articulating Borescope provides the ultimate inspection experience through cutting edge features and strategic design. 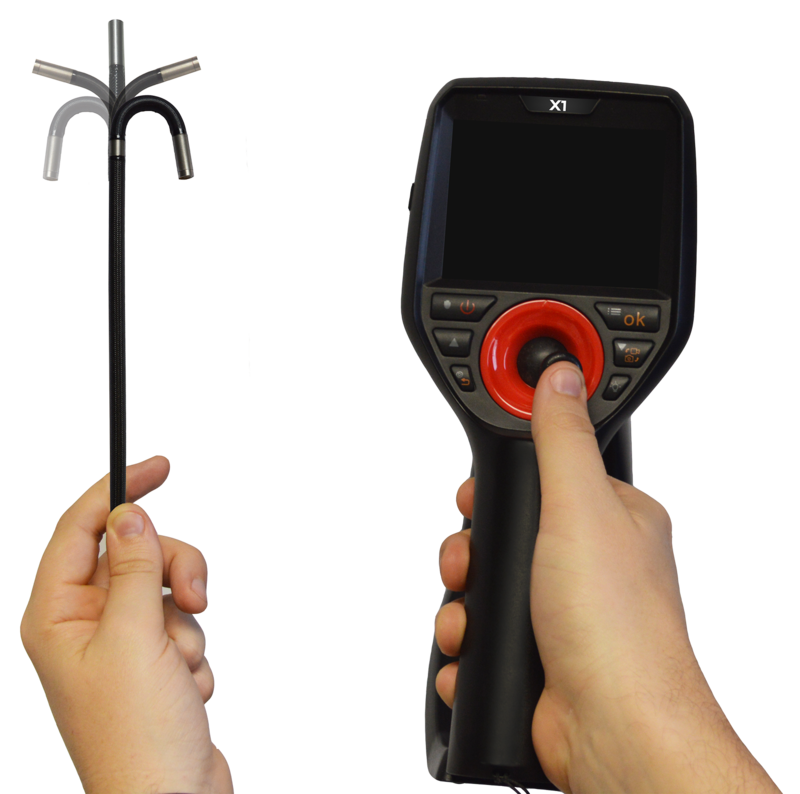 This motor-driven Borescope has the most impressive battery life of all our Borescopes at a price that cannot be beaten. 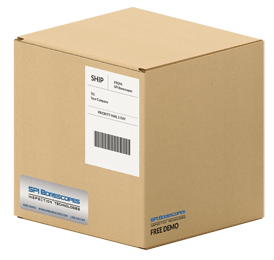 SPI Borescopes provides TWICE THE SCOPE for HALF THE PRICE. But don’t take our word for it- try a FREE, NO OBLIGATION DEMONSTRATION for yourself, and see what you have been missing.